Welcome back to Boca snowbirds!! If you are looking for a great look for your hair while spending your winter in South Florida, Salon Sora can make you look fabulous. It seems the rage with hair color is Ombre these days. Every stylist’s blog is using this term. In case you’re unfamiliar with the Ombre styles here’s our description. This is where the roots of your hair are darker and natural shades while the bottoms are and highlighted at the ends. You’re probably seeing this ultra-hot look throughout South Florida, especially Boca Raton. If you are bold and expressive, you’re going to love this look. Try tinting the ends to pastel pinks or blues to give a wild and fun splash to your do. This looks spectacular on platinum blonde hair. Grays and purples are bohemian rhapsodies with tanned skin. Dark brown to light Carmel is a gorgeous alternative for brunettes. Or if you’re a little more daring try bronze tips. This is a dramatic look that can extra class to even the most subdued browns. With contrasted colors, the ends can be a variety of anything from blond to reds to blacks leaving the roots soft and untouched. Think of multi-colors that don’t blend, each making its statement. Fiery reds look simply dashing with coppers, strawberry, and blondes dabbled together. The darkest red needs to stay on the top and then cascades to the lighter bottoms of the tips. Chocolate and Cherry will blow everyone away. The point is not to be subtle. You’ll turn heads with an Ombre look of Mahogany fading with violet or red to spice up any night on the town in Boca Raton. This is a great look for Latina’s and People with Dark Complexions. Platinum blondes dramatically change their locks by adding deep reds to the ends. It’s a retro style that can give any angel a little bit of an edge. The next time you’re ready for a quick change ask your stylist to show you samples of reds that would spruce up your white locks. Even short hair gets a quick boost with the contrast of the darker roots with highlighted ends. The change of colors gives the illusion of fuller hair. 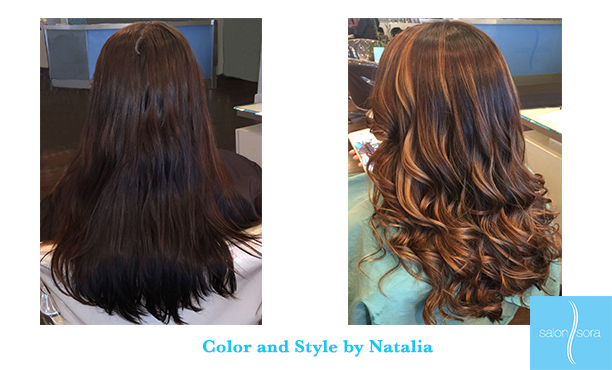 Ombre Styles are the latest trend, but it appears this look will be here to stay for a while. Speak to your stylist who can offer more advice for skin tones and colors. Stop by or call our Hair Salon in Boca Raton and let us make you look your best! !